Need some flexibility in positioning an attachment? The double ball joint may be what you are looking for. This simple device consists of a pair of standard Super Clamp-compatible studs with 3/8" female threads on one end and 1/4" female threads on the other. Both studs have a ball on one end. The balls clamp into sockets on the two-piece locking mechanism, powered by a large, positionable locking handle that turns into a substantially-sized bolt. While the double ball joint is extremely positionable, the overall movements are primarily in a single axis. However, since the ball/studs rotate 360°, rotational positioning remains very easy. Multiple manufacturers offer double ball joints and there is little variation between the quality brand options. These are very solidly built, all-metal devices weighing about 1 lb (453g) and measuring about 5.7" (14.5 cm) extended. The Manfrotto double ball joint I am using works very well, with little slip-stick effect right up until locked very tightly. Double ball joints are available individually, but generally attachments are needed to make this device useful, and kits offering the most-needed super clamp and other accessories are available. One kit frequently offered includes a camera mounting platform such as the Manfrotto 143BKT (came in my kit), making a very affordable camera mount. Attach a quick release clamp to the platform for Arca-Swiss clamp compatibility. Prefer to work from a ball head? A 3/8" to 3/8" Adapter Spigot is all that is needed for most heads to mount on the double ball joint. While the double ball joint provides significantly more camera positioning options than the tripod head mounting plate, it is less versatile than another tool often paired with super clamps – the Magic Arm. As the magic arm's appendages add up to more than 20" in total length, the camera (or other attachment) can be positioned farther away from the surface on which the super clamp is attached. However, under many circumstances, the compact size/weight of the double ball joint will prove favorable for those who prioritize packing small and light over extreme versatility. The other major advantage held by the double ball joint over the Magic Arm is significantly reduced vibration, the biggest price paid for those long arms. Mount a super clamp to both ends for enabling attachment of a great variety of items to each other. For a low price, the double ball joint provides a great amount of functionality. 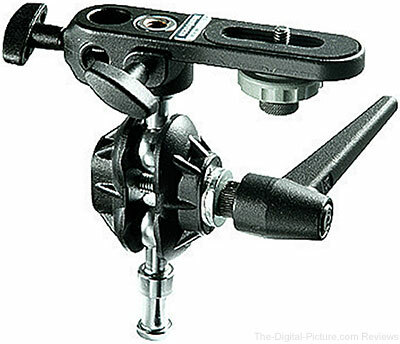 Add at least one of these great-value accessories to your kit for increased versatility.